I did it, I survived six weeks in a leg cast. Okay, fine. There’s still plenty of activities to enjoy – yoga, snow shoes, Costco…. I went home and quickly discovered Problem #1: we moved into our new house a few days earlier and some boxes had yet to be brought from the old place. The only shoe I had was the one shoe on my good foot when we moved. So back into the car with my aircast to reunite with my beloved footwear collection. What to wear first…? Wait, my choices would be limited by the snowy conditions. So then, which boots to wear first? Black, definitely the black boots. Maybe the red. Or the tan. I burst through the door and tore off the air cast, sitting on the step to pull on my go-to black boots. Cue record scratch. Hello, Problem #2. My newly freed foot is still so swollen and sore that it wouldn’t go into the boot. Not even maybe. No amount of butter, prayers, or stubbornness could get my Fred Flintsone foot into the lady boot of my choice. 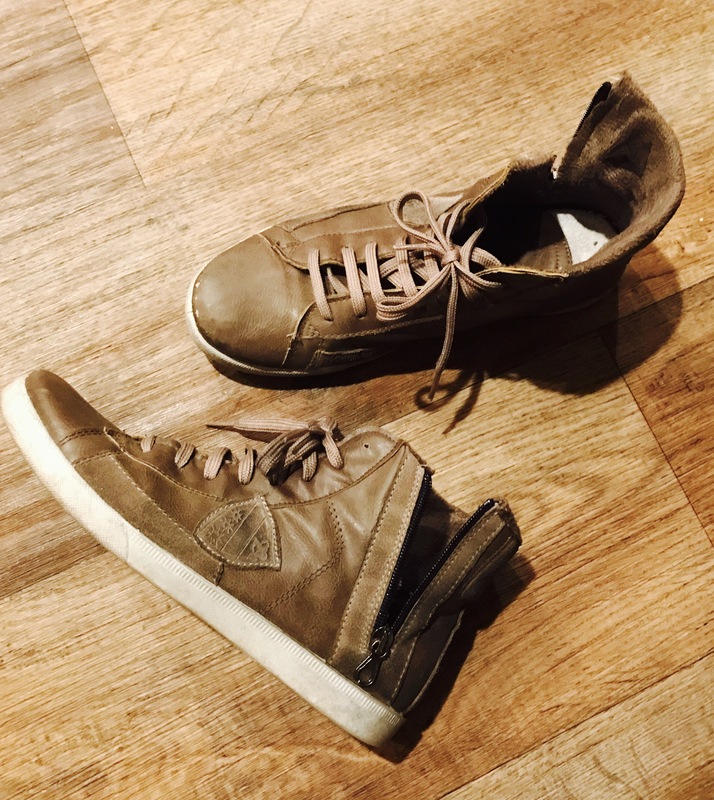 I then began working my way through the closet, realizing to my disappointment that the only shoe to fit was a leather high top, the mate to the one shoe I had worn on moving day. Le sigh. Furthermore, I now walk like a zombie. My leg is squooshy and the ankle is tender. It turns out that a lower leg break is generally preceded by a bad sprain – a limb twisted bad enough to snap the bone is going to have a lot of soft tissue damage, which is slower to heal than the bone itself. So yoga and snow shoes and shopping will have to wait. I’d looked forward to February 9th as THE day, the cast would come off and rainbows would shine and crowds would part as I sashayed through on two feet, but what I got was….pfffft. I’ve spent the past two days drawing analogies between all this and recovery, shaping a blog post to capture the lesson but…more pffft. I’m sick of myself. I’m sick of my thoughts, I’m tired of the voices in my head. I’ve spent way too much time there lately and I just. can’t. even. anymore. I’d rather hear what YOU think. What lesson do you see in this moment? What analogy can you draw between this scenario and recovery? Please comment with your insight, I’d love to hear it. Meanwhile I’ll get back to drawing the alphabet in the air with my toes, which is supposed to help bring my leg back to life, pausing only to read your comments and give thanks. Hello Jean. I hope your leg is improving. Your story reminds me a lot of my many attempts at recovery over the past 4 1/2 years. After 9 months (or 9 weeks, or whatever) I think “Great, I’m fixed. I can be a normal drinker!” But ouch, that shoe doesn’t fit any more, and back I go into recovery mode. Of course, the analogy isn’t perfect because your leg will heal, and you will be able to fit into your old shoes and boots, and ultimately return to your active life. Thank you for your blog and the work you do on the Bubble Hour. I’ve been following both for years, and they’ve been very helpful to me. I’m a fellow Canadian, a mom and grandma, whose life looks great on the outside…….But I hate to admit that I’m back to day 4 for the I don’t know how many times. It’s a process, and every time, I learn more about myself, and what I need to do. Two steps forward, one back and at least half sideways – that’s my analogy. Recovery is not a smooth road one where we can plan the next position. You can’t say. I’ll complete my Step 9 by 11th Dec. Therefore on 15th Dec I should have a discernible comprehension of serenity as is promised in the Step 9 promises. Btw what outcome measure of serenity comprehension are we all using so we can combine our results in a global controlled trial of best practice recovery methods? If only recovery was simple like that, a protocol written that when followed was guaranteed to give you measurable improvement, constantly, consistently. I’d don’t happen like that round here. It’s up, down, forward, backwards, sidewards, diagonal and never ever constant, repeatable or necessarily easily discernible. Hi Jean, glad to hear the cast is off and you are slowly recovering. And here in lies the analogy…easy does it. How does an ant eat and elephant? One bite at a time baby. So like you’ve shared with us many a times both here and in the podcast, we can only pull off the work of recovery and renewal one day at a time. Those days slowly add up, and though it might seems daunting and overwhelming at times, only my focusing on the now and then looking back at how many days we have accumulated do we notice our strength and resilience. In doing so I closed on 68 days sober, and getting stronger everyday. Thanks and congrats on your recovery! Get yourself a compression sock for your ankle, it will help decrease the swelling. One that goes from the base of your toes to above the ankle, no hole in the heel. Not tight. You’re welcome!! Okay, going to store to pick up some today! Recovery and a wobby leg freed from a cast- in both cases the first couple of steps are the most difficult. Then, day by day and step by step, you get your footing and in no time, you’ll hit your stride. The same self-care practiced in early sobriety can be applied to leg recovery! It’s winter and we’re all trussed up in sturdy, sensible footwear.Lots of time to heal before bare legs and sandal season around here! Instant gratification. We all want it. Now. In early sobriety I expected to feel better immediately. When I didn’t, I questioned if sobriety was right for me. Shouldn’t birds sing and unicorns poop rainbows? In the end, anything worth doing is worth putting in effort. You have a lovely opportunity to reacquaint yourself with your body. Go to yin yoga. Try restorative. Go to an hour long meditation. Let go of the idea of moving and focus on taking real time to be still and slow. I know you do these things…maybe you will find they become permanent additions! I’m glad you are free of the cast. Now treat yourself gently and kindly! Thanks, Anne. I can’t wait to get back to the mat. That was my initial thought, the rest of me is going aaaahhhh more sitting !! Nooooo. I am careful about my weight and would be worried about inactivity in all aspects, so after all my anxieties are out, we are back to meditation !! I don’t think I have an analogy, but I have a lot of empathy. It was decades ago but when I broke my wrist and was in a cast up above my elbow, I was in so much pain when they took the cast off. My elbow joint was frozen and the pain I felt as I tried to straighten my arm almost made me pass out. And that was followed quickly by the panic and disappointment I felt, fearing that I wouldn’t be able to start the summer job I had lined up because my arm was so weak. It’s one of those things that only time helps 😦 I’m sorry you are going through it! Here’s my analogy. When I was drinking, things looked good from the outside. High achieving! Successful career! Involved parent with great kids! Caring daughter and sister! Supportive wife! Kind of like a pair of killer boots with pointy toes and stiletto heels. Wow, those are amazing! So cute! But how did wearing those boots every day really feel? Unbelievably painful. So much anger and resentment. So much self doubt that I tried to hide from the world and myself by appearing to have it all together. I finally got to the point where I couldn’t take the pain anymore. I stopped drinking. I took off the stilettos. I could wiggle my toes! It felt so good! That is until I started walking over jagged rocks and burning hot concrete in my bare feet. Ow! This still hurts! I’ve got no protection! Maybe I should put the boots back on! Finally, I started down the path of recovery. I found some wonderful people farther ahead of me who called out, “Come over this way! The rocks give way to soft sand over here!” I met fellow travelers on this journey and together we’re helping each other figure out ways to nurture and protect ourselves. Today I’m choosing, whenever possible, to take the easier path instead of climbing a mountain to prove I can do it. I’m putting on boots with low heels & arch supports that don’t draw admiring comments but feel absolutely fantastic. That’s what long-term sobriety is to me, a pair of comfy shoes that help me get to where I need to go… or just stand still and take in the view. So, the fact that one of your first questions to your doctor was “can I ski,” reminds me of recovery. You think after you get a certain number of sober days under your belt, you are “healed” now and go back to drinking. But the healing must continue. Just yesterday, I was seriously contemplating getting a six pack to celebrate my first 50k race. It seems all trail racers celebrate with drinking. I went as far as looking up how many days I’d been sober and told myself if it’s a nice rounded number, it was a sign that I can now “drink moderately.” Stupid. Luckily it was 866 days. No signs! And today I’m so thankful it didn’t tell me 1000, or 900, or hell, even 875 yesterday!!!! So true. Glad you did the next right thing. We want it all NOW!! Being patient is so hard!! Bahahaha this cracks me up! Hello Jean. Glad to hear your cast is off and you’re onto your next phase of healing. Your frustration and disappointment with the healing process reminds me very much of my own recovery and healing. I can’t tell you how many times I’ve said (to myself) something along the lines of “I’ve done (fill in the blank with healthy self-care thing) for (fill in the blank with time) and now I should be (fill in the blank with my expected result). BUT the truth is that all we can do is take great care of ourselves and support our own healing (be it physical/emotional/spiritural, etc)…and let the healing happen in it’s own time because no matter how much we what we want to control it…. the healing is going to happen in it’s own time, on it’s own trajectory. And often once I’m on the other side of something…. when I look back, it’s quite wonderful to marvel at my body and soul’s ability to heal. Sending thoughts of mending and strength your way. This is a process just like recovery. You will wake up one morning, and pinch yourself because you will feel amazing once you heal and everything comes together again. Congratulations on the milestone! Keep on keeping on! I am 66, with 13 months recovery. I am currently being evaluated for a hip issue that started when I was up on a ladder and hanging drywall 8 months into recovery . As soon as I realized this is serious ( and looking like possible hip replacement ) I began a frantic search for the one thing that will bring my life back: physical therapy, yoga therapy, acupuncture, very strange Ayurvedic herbs, ….. Still hip pain and a limp and a visit to an ortho doc next week. I do not regret a minute of the things I have done to try to return to my previous state of being. And I literally laughed out loud when I realized how, for 10 plus years I took a nightly poison( Chardonnay) knowing it might induce a hangover, fearing it may damage my liver or brain, feeling lousy about myself. ( where was that fierce woman who now fights for intactness? )Alcohol kills that passion to hold on to the most precious things in your life. It keeps you afraid you might lose everything but helpless to act. Your search for your perfect shoes just feels like you grabbing on to wholeness , something I think all in recovery can get. We don’t want to be broken anymore! You will be in your cute shoes before you know it. “Alcohol kills that passion to hold on to the most precious things in your life. ” yes!! So true! I’m so glad I read this! Sorry for your misfortune of course but I’m day 2 again after many attempts and surburban Betty has it right in my opinion. Expectations can be our downfall in sobriety and in any other recovery. Easy does it they say in AA and I’m beginning to see why. Also with my nursing hat on it’s essential that we strengthen the surrounding muscles. Physio for the leg and mind physio for sobriety, guards against mishaps in the future and strengthens and supports us. Great post by the way….I like the brown boots! Maybe the lesson is to learn to be still so you can listen to the layer that’s playing beneath the surface. What’s on the “B” side? Perhaps the meaning is to give you time to contemplate what your next work will be– is there a bigger audience? Is there a book? Have you been called to change the social brand of drinking altogether? Will you enter the prevention side of the equation as well as still helping others recover from their tumbles? I only ask because I have found that colds are always dropped on me when I need to step out from behind whatever tree I’m cowering behind. Like I’ve been wondering where to find the right CEO for a new venture– and then I got a cold and realized– duh– YOU are the CEO. Just sharing. Recovery is about becoming unshackled, but also learning to feel raw pain and disappointment. Recovery is about dropping a big weight, and re-learning, sometimes a bit awkwardly, how to do simple things. Recovery is about marathon patience. And it does pay off. This is hard, I had a similar experience at a destination wedding a few years ago. I ended up going to my room and doing sudoku puzzles on the patio with my tea at night. Then I’d get up early and go for a nice cappuccino, take a walk on the beach before all the hungover people appeared, and put my energies into enjoying the morning and avoiding the nightlife. Great job getting through. Four months is great! Keep going. You should read “How to Party Sober,” by Rachel Black. Killer.